The Euphrates (the traditional Greek name, Arabic: الفرات Al-Furat, Armenian: Եփրատ Yeṗrat, Hebrew: פְּרָת Perath, Kurdish: Ferat, Azeri: Fərat, Old Persian: Ufrat, Syriac: ܦܪܬ Frot or Prâth, Turkish: Fırat, Akkadian: Pu-rat-tu) is the westernmost of the two great rivers that define Mesopotamia (the other being the Tigris). In the Bible, God's promise to Abraham and his descendants (which also includes Isaac and Jacob) of the promised land extends to this river. The name Euphrates may have originated from Old Persian Ufratu, as it were from Avestan *hu-perethuua, meaning "good to cross over" (from hu-, meaning "good", and peretu, meaning "ford") . 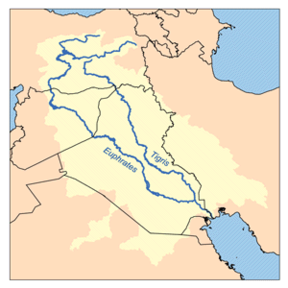 Alternatively, some suggest that the name Euphrates is possibly of Kurdish origin. In Kurdish, fere means "wide", re means "flowing water" and hat is "flowing", giving fererehat, meaning "wide flowing water". The modern Kurdish name, Ferat, is possibly a reduction of the older name. However, the Indo-European etymology of the name is put into doubt by the Sumerian and Akkadian names for the Euphrates are Buranun and Pu-rat-tu, respectively, Buranun being attested in an inscription associated with king Gudea ( 22nd century BC). It seems thus likely that the Old Persian name arose by popular etymology based on the pre-Iranian name of the river. The river is approximately 2,780 kilometers (1,730 miles) long. It is formed by the union of two branches, the Kara (the western Euphrates), which rises in the Armenian highlands of today's eastern Turkey north of Erzurum and the Murat (the eastern Euphrates), which issues from an area southwest of Mount Ararat, north of Lake Van. The upper reaches of the Euphrates flow through steep canyons and gorges, southeast across Syria, and through Iraq. The Khabur and the Balikh River join the Euphrates in eastern Syria. Both rivers have their origins in Turkey. Downstream, through its whole length, the Euphrates receives no further water flow. North of Basra, in southern Iraq, the river merges with the Tigris to form the Arvand/Shatt al-Arab, this in turn empties into the Persian Gulf. The Euphrates is only navigable by very shallow-draft boats, which can reach as far as the Iraqi city of Hit, located 1,930 kilometers (1,200 miles) upstream and which is only 53 meters (58 yards) above sea level. Above Hit, however, shoals and rapids make the river commercially unnavigable. Its annual inundation, caused by snowmelt in the mountains of northeastern Turkey, has been partly checked by new dams and reservoirs in the upper reaches. A 885 kilometer (550-mile) canal links the Euphrates to the Tigris to serve as a route for river barges. A river named Euphrates is one of the four rivers that flow from the Garden of Eden according to Genesis 2:14. 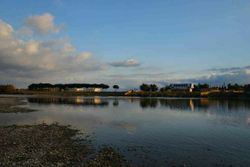 It is the fourth river, after the Pishon, the Gihon, and the Tigris, to form from the river flowing out of the garden. The river of the same name marked one of the boundaries of the land promised by God to Abraham and his descendants (Isaac, Jacob, etc). In the Hebrew Bible, it is often referred to simply as "The River" (ha-nahar). The word Euphrates is a translation for the word "Gush forth" or "break forth". It has always been assumed to mean "river" but this is not explicitly stated. It literally means "breaking forth of liquid". The river Euphrates was named from this root word, "To gush forth". In the Book of Revelation, it is prophesied that in the " near future the Potamos Euphrates or "breaking forth like water" of the middle east will dry up in preparation for the Battle of Armageddon. In Islam, some of the hadiths of the Prophet Muhammad, suggest that the Euphrates will dry up, revealing unknown treasures that will be the cause of strife and war. Soon the river Euphrates will disclose the treasure [the mountain] of gold. So, whoever will be present at that time should not take anything of it. — Sahih Bukhari. The Prophet Muhammad said: "The Hour will not come to pass before the river Euphrates dries up to unveil the mountain of gold, for which people will fight. Ninety-nine out of one hundred will die [in the fighting], and every man among them will say: 'Perhaps I may be the only one to remain alive'." — Sahih Bukhari, Sahih Muslim. The Prophet Muhammad said: "The Euphrates reveals the treasures within itself. Whoever sees it should not take anything from it". — Al-Muttaqi al-Hindi, Al-Burhan fi `Alamat al-Mahdi Akhir az-Zaman, p. 28. It [the Euphrates] will uncover a mountain of gold [under it]. — Sunan Abi Da'ud. The Euphrates provided the water that led to the first flowering of civilisation in Sumer, dating from about the 4th millennium BC. Many important ancient cities were located on or near the riverside, including Mari, Sippar, Nippur, Shuruppak, Uruk, Ur and Eridu. The river valley formed the heartlands of the later empires of Babylonia and Assyria. For several centuries, the river formed the eastern limit of effective Egyptian and Roman control and western regions of the Persian Empire. Also, the Battle of Karbala occurred at the banks of Euphrate river, where Imam Hussain, along with his family and friends, were martyred. As with the Tigris there is much controversy over rights and use of the river. The Southeastern Anatolia Project in Turkey involves the construction of 22 dams and 19 power plants by 2005, the biggest development project ever undertaken by Turkey. The first of the dams was completed in 1990. Southeast Turkey is still struggling economically, adding fuel to the discontent expressed by Turkey's Kurdish minority centered there. The Turkish authorities hope that the project will provide a boost to the region's economy, but domestic and foreign critics have disputed its benefits as well as attacking the social and environmental costs of the scheme. In Syria the Tabaqah Dam (completed in 1973 and sometimes known simply as the Euphrates Dam) forms a reservoir, Lake Assad that is used for irrigating cotton. Syria has dammed its two tributaries and is constructing another dam. Iraq has seven dams in operation, but water control lost priority during Saddam Hussein's regime. Since the collapse of Ba'ath Iraq in 2003, water use has come once again to the fore. The scarcity of water in the Middle East leaves Iraq in constant fear that Syria and Turkey will use up most of the water before it reaches Iraq. As it is, irrigation in southern Iraq leaves little water to join the Tigris at the Shatt-al-Arab.